For Hayden's first Halloween, we really got in the spirit. 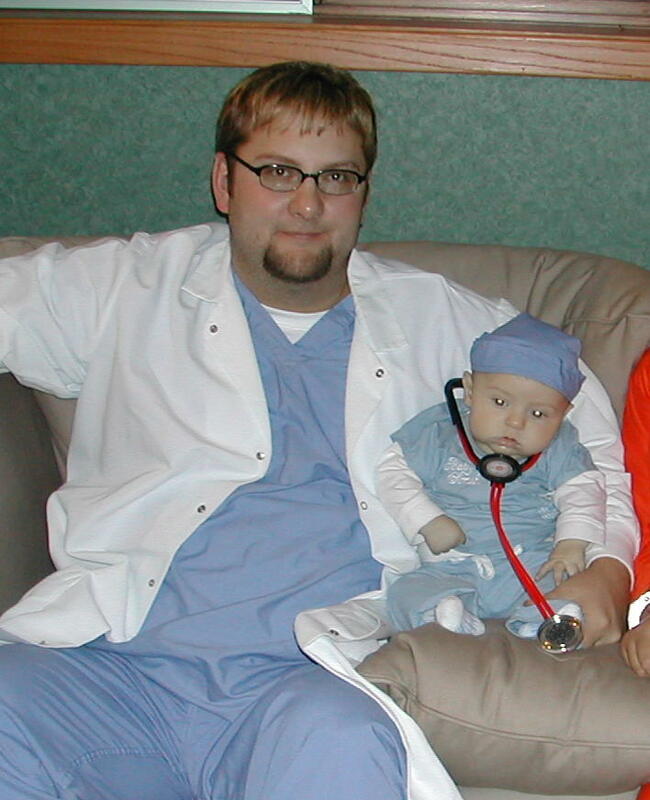 Hayden dressed up as a doctor (resident) and Dennis was his boss, the consultant. We got the little baby scrubs from 'Aunty' Shannon for a baby shower gift. So my mom and I made the hat and bought the Fisher Price kit and Hayden looked like an official doctor! I got the idea for my costume from my best friend Jenny. 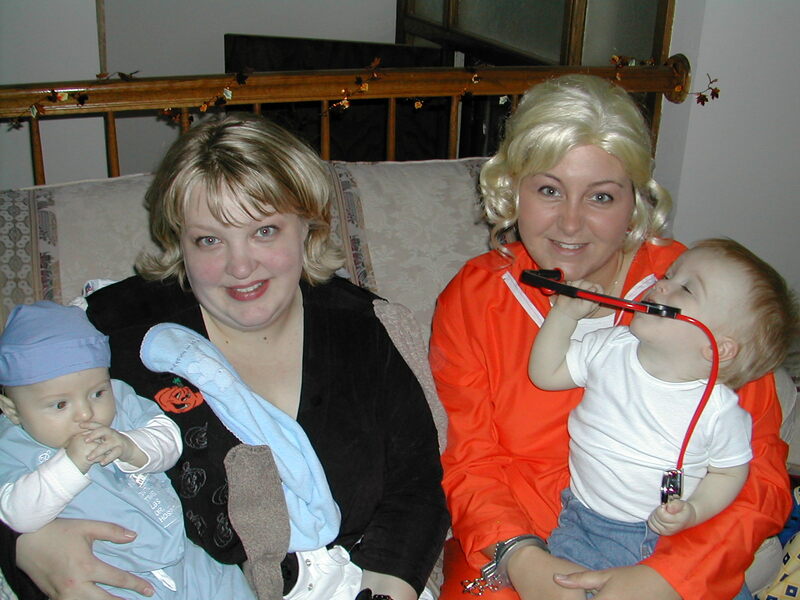 I was Martha Stewart.........in the flaming orange jumpsuit, handcuffs and all. We went to Jenny and JPs house for a halloween party and got to see lots of little ghosts and goblins! We also had to make our rounds to see Grandpa Scanlan and Grandma & Grandpa Deden. While we were at Grandpa Scanlan's, we ran into the little cousins. I unfortunately didn't get any pictures of them..........maybe I can get them to give me some copies of pictures they have so you can see how cute they all were! We didn't get back home until about 6:30 - 7pm and we only had 2 trick-or-treaters! So, that means lots of candy left over for us! :-) Here are some pictures from that night! 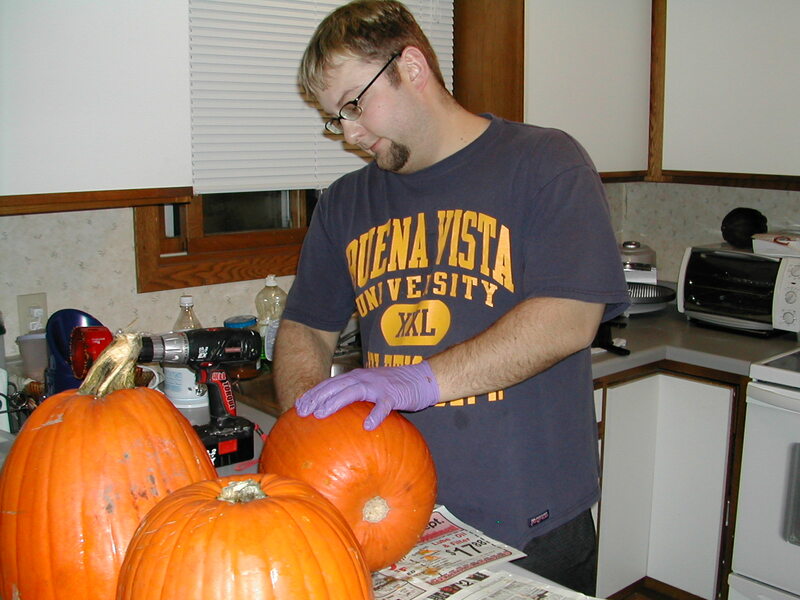 This is Dennis getting ready for Halloween, by carving pumpkins. 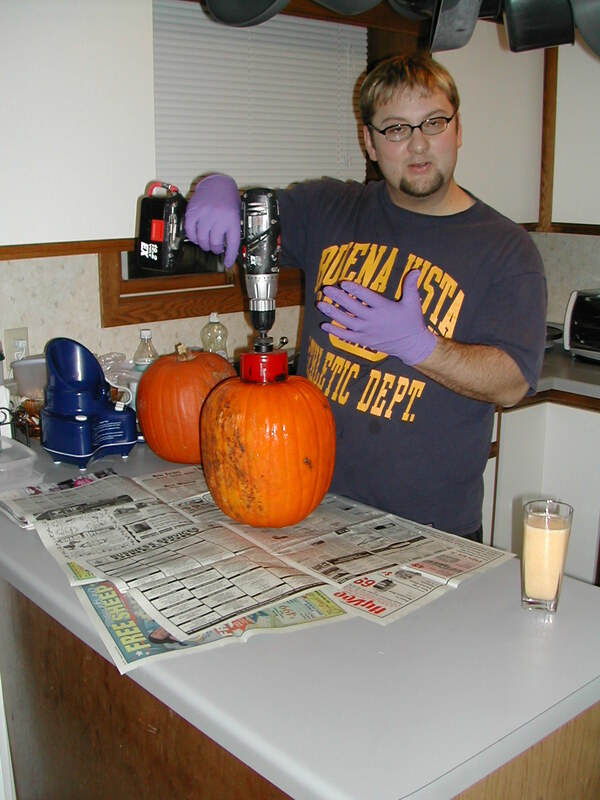 Of course he'd have to get the 'power tools' out to do the carving this year. It actually worked very slick! 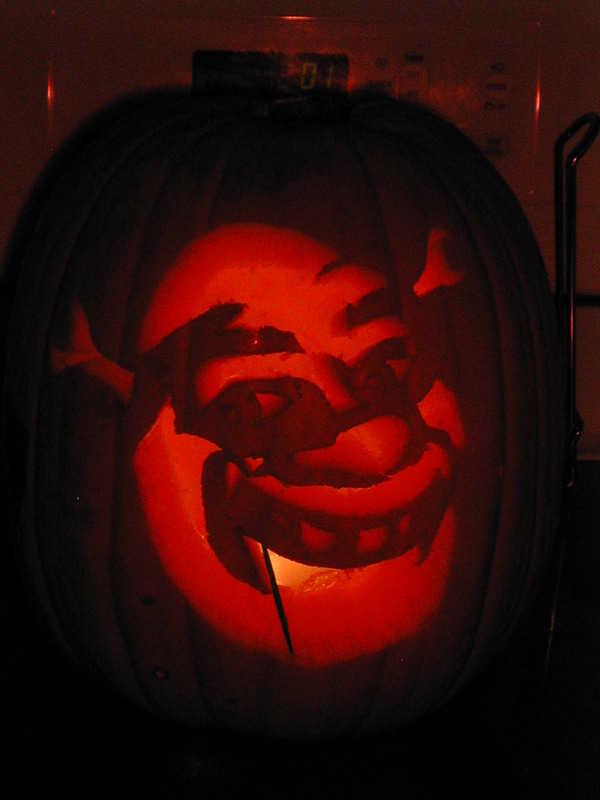 We each picked out a design to carve in the pumpkin. 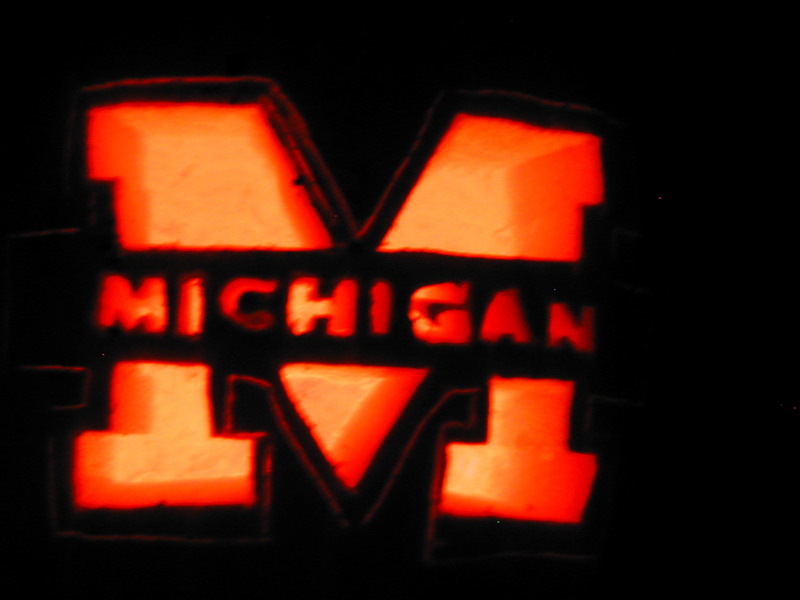 Dennis did the Michigan one (of course) and he carved my Shrek pumpkin as well. 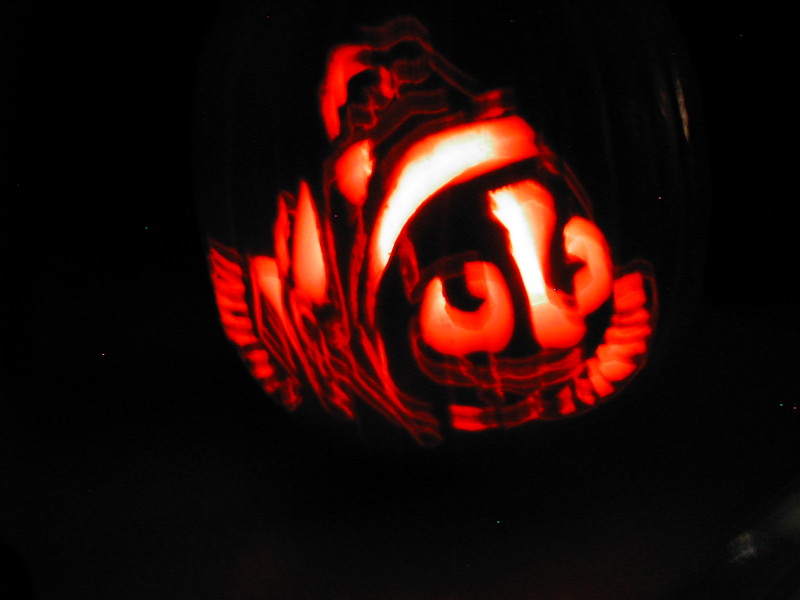 I quickly carved Hayden's Nemo pumpkin............so it didn't turn out the greatest. But........the pictures are a little blurry, I think from the flickering of the candle. Missy was STATIC CLING for Halloween........she was wearing black and had all kinds of things pinned all over her clothes, washclothes, socks, onesies,and even pantyhouse! Alex was a chicken but had gotten too hot with all his gear on, so I didn't get a picture........Missy is supposed to send me a picture of him in his costume.......then Dan was a 'chicken farmer'. We just thought it was so cute how the Dads got all dressed up too! 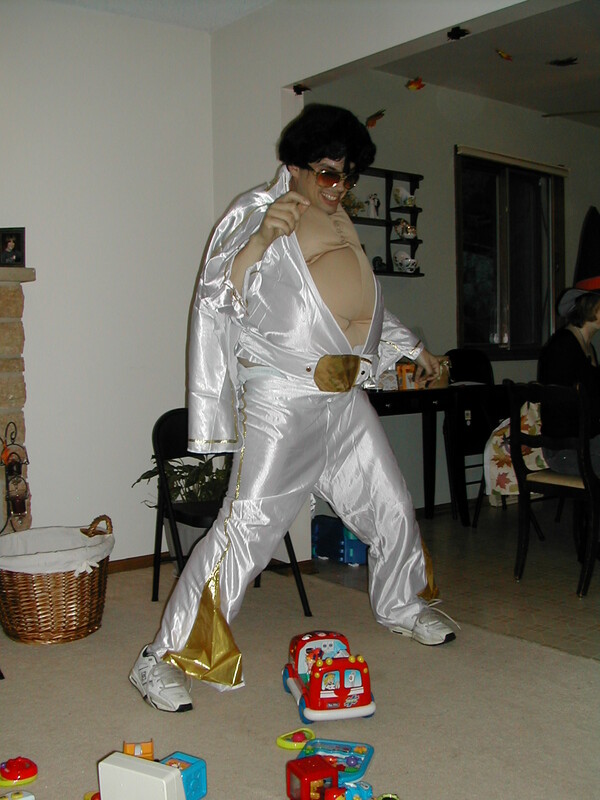 Here's JP as 'Fat Elvis'..........doesn't he look great? He had the kick and the poses down! Jenny was the "Queen of Everything" so the two of them together were the Kind & Queen. Jenny didn't have her costume on when we got to the party.........she too got to warm.